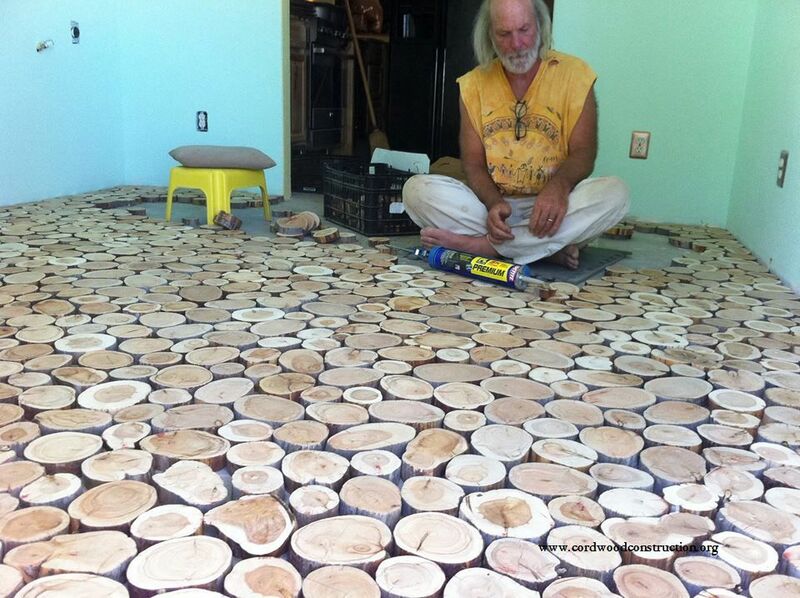 Sunny is laying out the hardwood discs. 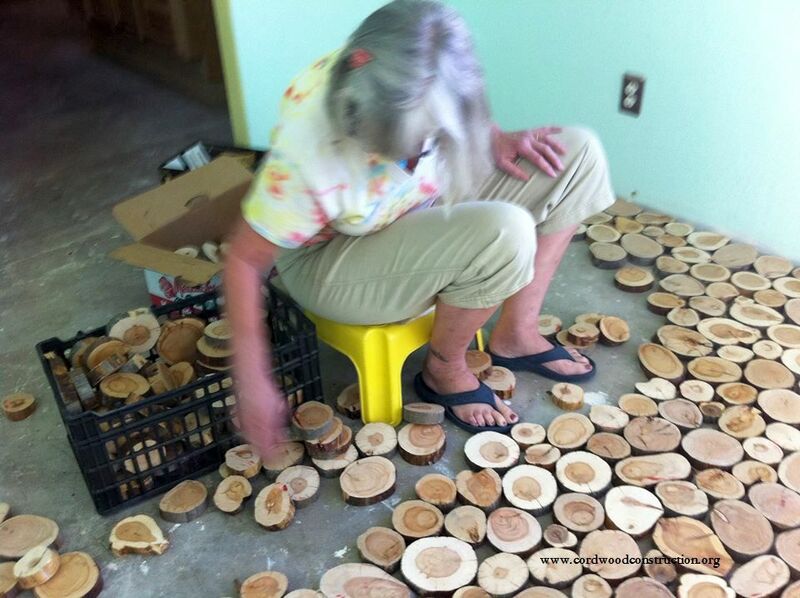 Run each piece through the chop saw set at 1″. Prepare surface by sweeping and mopping clean. We are gluing directly onto our concreet slab. 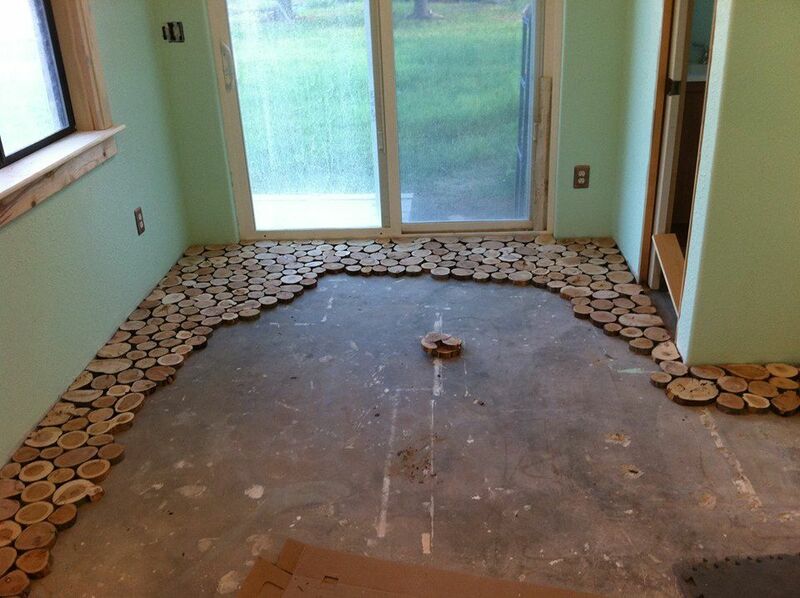 Sand both sides using a belt sander.Begin to layout disks on the floor. Try to get them as close as possible. Work in 2′ sections. Glue the pieces down and firmly tamp them. We’re using Loctite PL Premium Construction Adhesive. Apply a light coat of polyurethane to the surface of the disks (this is to prevent the grout from adhering to the tops). Grout the spaces between the slices with a mix of 80% tile grout, 20% sawdust. 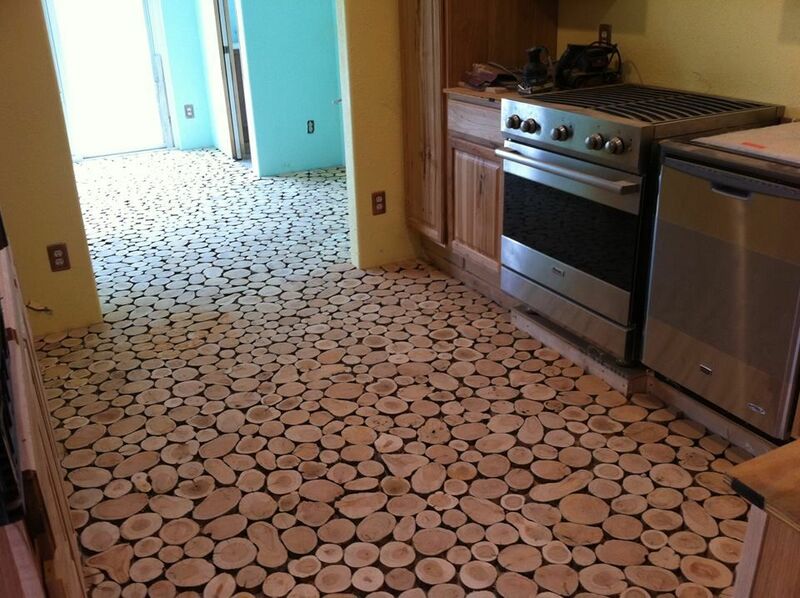 Your local flooring store will have many options. Apply 2-3 coats of polyurethane to finish. 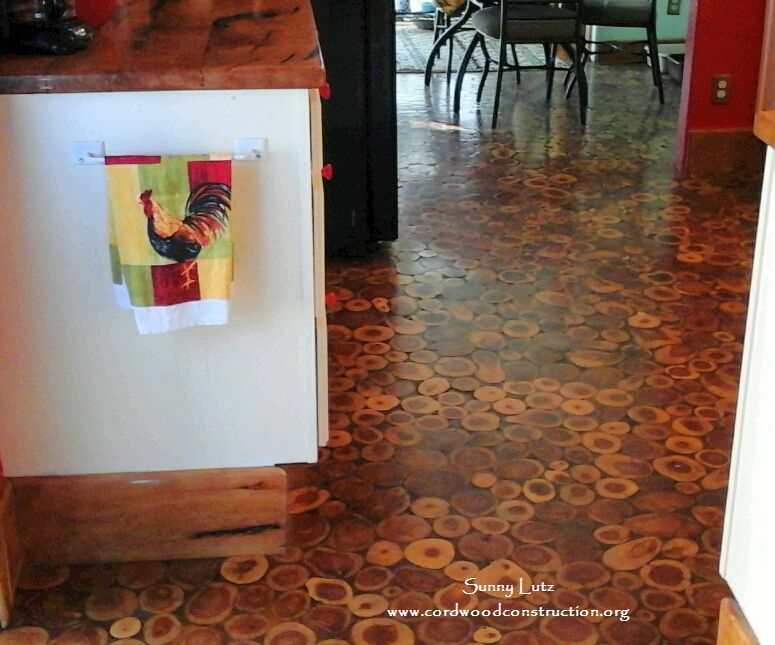 Here is a detailed list of how Sunny and her husband Tony made this beautiful cordwood floor! 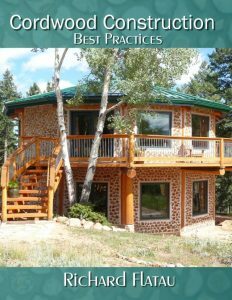 Cordwood Flooring Instructions by Sunny Pettis Lutz & Tony. If you don’t have wood you can access on your property, then go to your local Forest Service office or ranger station and buy a wood harvesting permit. Pack your pick-up truck with gloves, chainsaw(s), ax, come along and other tools as necessary. Go out to the forest and harvest dead trees. In our area (Arizona) that means Juniper and Pine. Pine and Juniper can be taken while standing. We are using Shaggy Bark Juniper and Alligator Bark Juniper. Look for wood close to the road on the uphill side. No one wants to be dragging these logs from the down-slope side. Cut down the dead wood using tools from step 2. Attach Forest permit to wood and take it home. 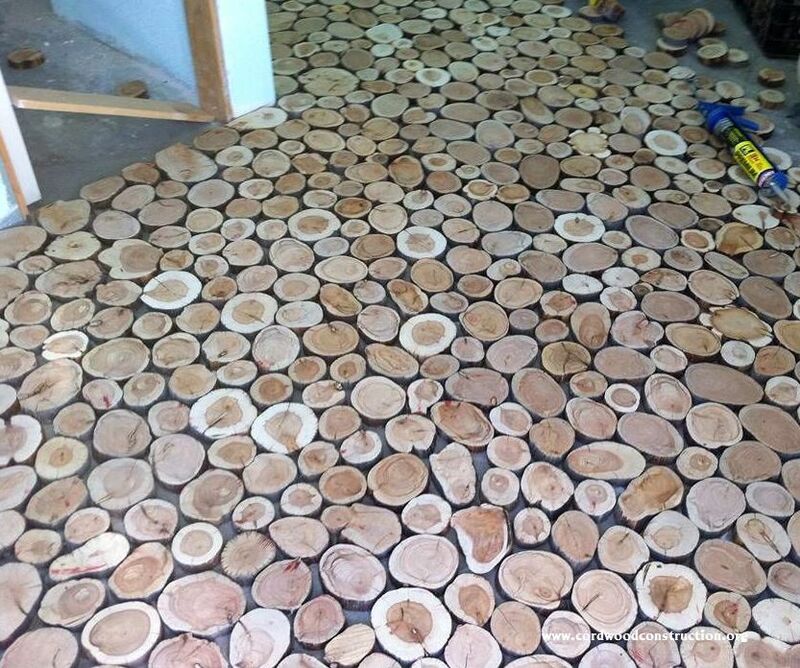 Sort what will be lumber and what is just good for firewood. Cut logs into manageable size. Sort ‘disks’ for usable ones vs bad ones. Remove any loose bark either by hand using a chisel or scraper. Prepare the floor surface by sweeping and mopping. We are gluing the slices directly onto our concrete slab. Sand both sides using a belt sander. Begin to layout disks on the floor. Try to get them as close as possible. Work in 2′ sections. Glue the layout you have chosen. We’re using Loctite PL Premium Construction Adhesive. Sand using a belt sander until everything is smooth and level. Use shop-vac to clean up all dust and debris. 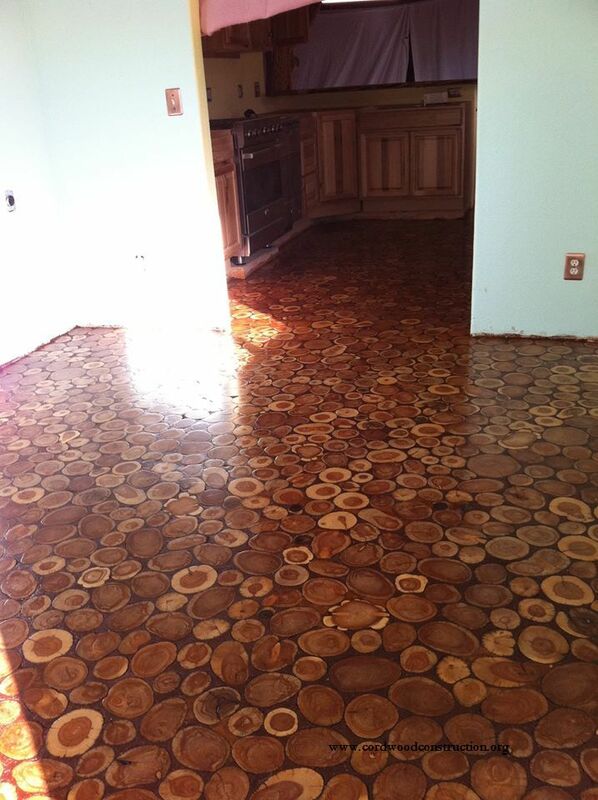 Apply a light coat of polyurethane to the surface of the disks. (this is to prevent the grout from adhering to the faces). Grout the spaces with a mix of 80% tile grout, 20% sawdust. 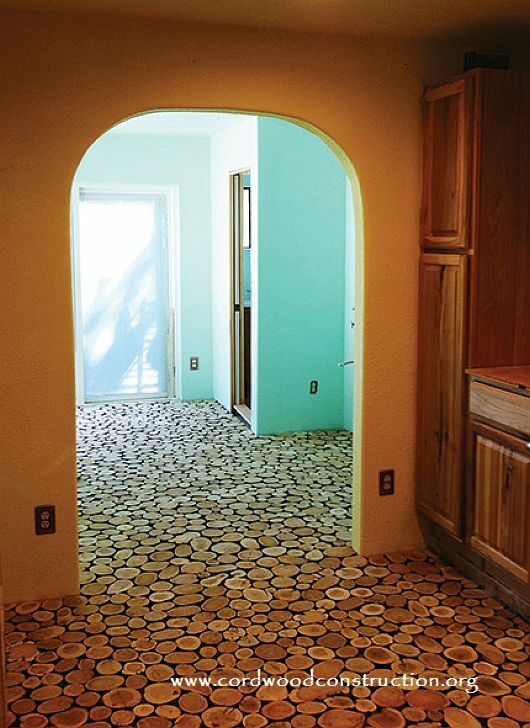 More pictures of Sunny & Tony’s floor. Do you think that Sunny & Tony raise chickens? What brought you to that conclusion? 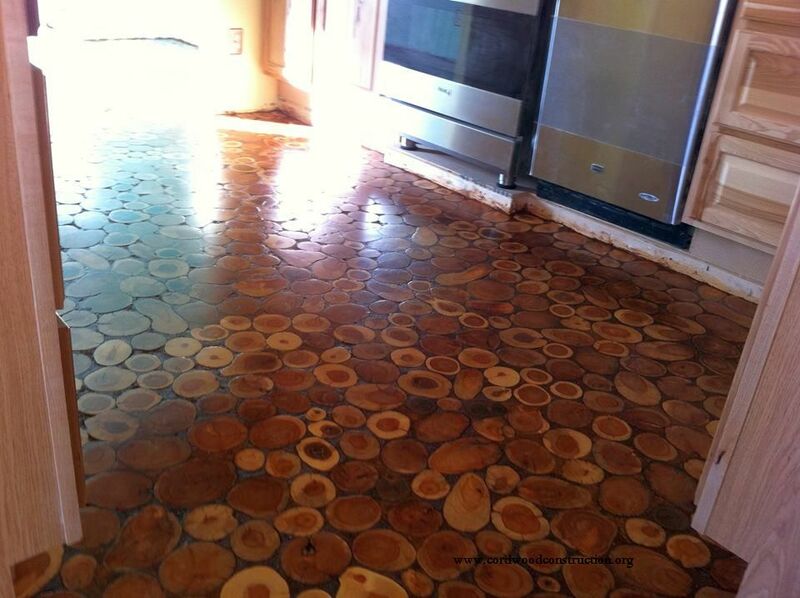 Click to see the other article on Cordwood Flooring.